This three-level home is perfect for large groups year-round. The voluminous and woodsy vaulted great room, with a wall of windows, offer fantastic natural light and magnificent views of the Continental Divide. There are 5 bedrooms (plus a loft with more beds), four full baths and two half baths. The property is great for weddings, receptions, reunions, or just vacations. 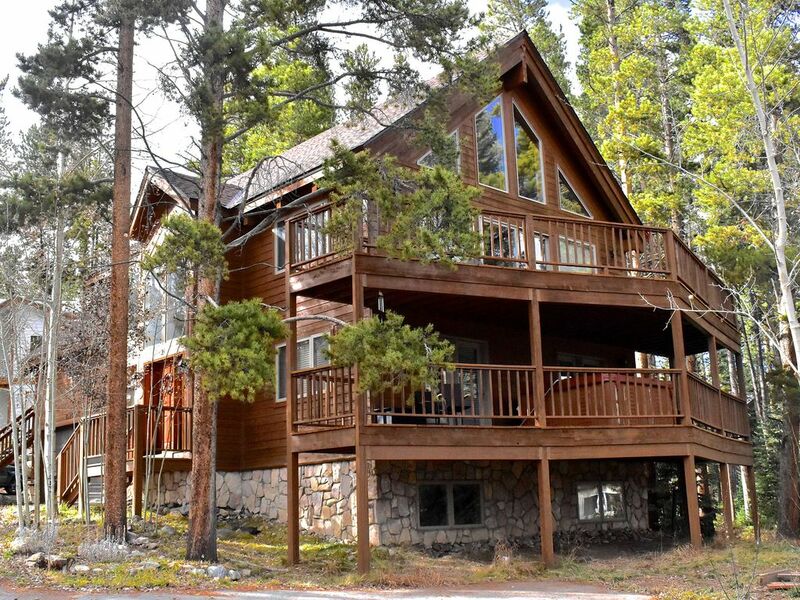 The home is located overlooking the town of Breckenridge, two blocks from the base of Peak 8. Breckenridge is a 140-year old Victorian mining town - a real town. It has more night life than anywhere else in Summit County, with over 200 restaurants and shops. Besides the usual skiing in winter and hiking and biking in summer, Breckenridge offers a summer music festival with orchestral performances from classical to contemporary music. If your group is larger than this house accommodates, OR you want to be closer to downtown Breckenridge, check out our other property, the McWilliams House, as an additional or alternative rental. Located just blocks from Main Street with great views of the ski hills, the McWilliams House is our family's favorite location because it's a short walk to the ski shuttle, the gondola, every restaurant in town and City Market grocery store. You park your car and may never use it again. The McWilliams House is VRBO listing #15822. House located on peak 8,2-3 blocks from base of peak 8 at Breckenridge ski area. It's possible when there is snow on the road. For an overflow of people, seating for 4 more is in the great room, adjacent to the dining area. (3) One large flat screen HDTV in upper level great room (with DVD player); one flat screen TV in master suite; one TV in lower level. Great stay for a large group. Convenient to town and the slopes. The place was perfect for our large group. Plenty of beds with excellent amenities. Darby was a great help. Anything that we needed she was quick to help. Cozy with a great view, The kitchen is perfect and beautiful as well as each one of the rooms. The space was great! And the location too! Unfortunately there were areas that seemed to have been overlooked during cleaning. For the amount we paid, I would have expected it to be renovated more. The kitchen was renovated at least! Overall we had a great time. Caretakers/managers were very easy to access with quick responses. Great place with plenty of place settings for our large group of 17 and beds to sleep on. Thank you!! This was our first trip to Breck and we arrived with 13 people, ranging from 10 to 70+. The house was set up perfectly for a group - all the kids could sleep in the bunk rooms downstairs and the three couples had bedrooms on the first floor. You are half a mile from Epic Discovery, which our kids loved, and also from the free gondola that goes into town. The gondola runs 9AM to 6 PM in good weather, otherwise, you can always take the free bus. There were a good amount of basic kitchen supplies in the house and even fun movies for the family. This house has obviously hosted many groups over the years and knows how to do it right - plenty of extra bed linens, laundry soap provided, etc, etc. The only thing to note is that the house’s caretakers live in a separate apartment on site, so don’t be surprised if you see extra cars in the driveway. There is plenty of space to park, by the way. Walk to town in the summertime (20 minutes, all downhill), have a happy hour, go shopping, eat dinner, then take the free shuttle up Peak 8! Play golf at the 27-hole Breckenridge Golf Course designed by Jack Nicklaus. Hike a 14er (14,000 ft. mountain--there are more than 50 in Colorado, and several nearby). Put your mountain bike on a chairlift and then ride down the ski runs (traversing, of course) of peak 8. $450 - $1195 per night Housekeeping Fee: $350 Tax: 5.775% Rent seven nights, pay for only six. *Check-in after 3PM - Check-out is 10AM *Advance payment - 50% with ten days; balance due 45 days before arrival. *Cancellation - 45 days or more, full refund less $100. *Security deposit - $500 will be charged and returned within two weeks of departure if there is no loss or damage.